I heard a lot of complaints about the Supergirl series on the Internet, and certainly there's plenty of cheesecake to be criticized here. 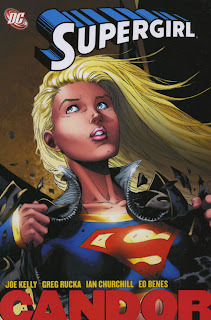 But in the able hands of Mark Verheiden, Greg Rucka, and Joe Kelly, I found that Supergirl: Candor really seemed to strive to be more than a "male fantasy" comic book--though there's plenty of that, too. That Supergirl: Candor has too many cooks--three main writers (more, if you count the additional materials)--shows greatly. The whys and wherefores for how Supergirl and Power Girl got to Kandor are never fully explained, and their escape is just as fuzzy. It's as if Kelly, taking over from Rucka, decided to abandon the plotline two issues in. Neither does Verheiden's Superman/Batman tale really have much to do with the Kandor adventure; the crossover seems more to place Superman/Batman one year later or draw readers over to Supergirl than to actually advance the plot. What redeems this is, if you turn off the most ardent filters of your brain, the story is just good. Verheiden's story makes no sense in modern continuity, but it touchingly fills in a Silver Age gap. Rucka and Kelly together offer two most welcome surprise villains; Kelly follows this with a mystery date for Supergirl that makes very little sense, but is fun to see all the same. The story ends with the burgeoning friendship of Supergirl and Wonder Girl over the shared loss of Superboy, and their sorrow is more moving than even that in Teen Titans; I actually started to tear up a little bit myself. Supergirl: Candor is by no means perfect. The particularly gratuitous scene of a half-naked Supergirl getting a tattoo is shortly followed by entirely naked Supergirl confronting Power Girl from the shower, and later she actually kisses her cousin Kal-El. Joe Kelly, in the end, tries to equate Supergirl to a Lindsey Lohan-type Hollywood celebrity, growing up under the spotlight and bowing under others expectations. It's a parallel that's interesting but doesn't quite work, or at least likely won't appease most fans Silver Age expectations of the characters, though the first scene of Supergirl smoking in a bar is amusing if for nothing else than its audacity. Taken for what it is, Supergirl: Candor is a trade with surprising heart, and hopefully sets a precedent for Supergirl's better future.